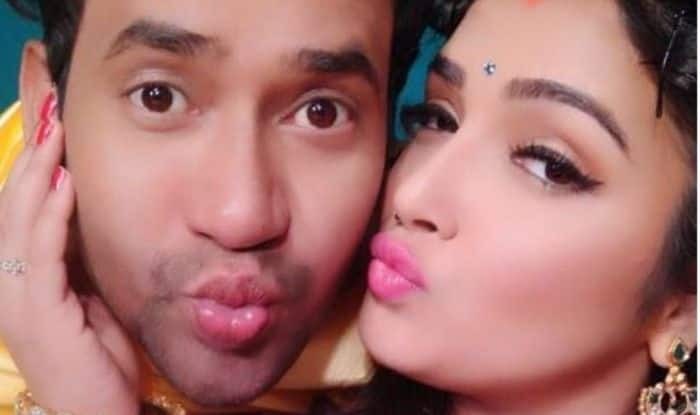 Amrapali Dubey's birthday wish for Nirahua is too romantic for words. Bhojpuri actor Dinesh Lal Yadav aka Nirahua has turned a year older today. There is no denying the fact that he is one of the most sought-after stars of the industry. Along with delivering back-to-back blockbusters, the star grabbed the limelight for his personal life as well. He is rumoured to be dating actress Amrapali Dubey for quite some time and the latter’s birthday wish proved that romance is indeed brewing between them. The gorgeous lady shared a romantic picture with the actor in which both of them can be seen pouting. Amrapali and Nirahua have never talked about the relationship but their PDA and social media posts indicate that they are head over heels in love with each other. A couple of days back, a song titled Choye Choye from their film Nirahua Chalal London was released and it went viral on the social media. It is the Bhojpuri version of popular Daler Mehendi’s track Bolo Ta Ra Ra Ra. Earlier, both the stars featured in many successful projects together. They worked together in Patna Se Pakistani, Bam Bam Bol Raha Hai Kashi, Satya, Nirahua Hindustani 2, Border and Dulhan Ganga Paar Ke. Now, they are all set to take the digital world by storm with ALTBalaji’s first-ever Bhojpuri show Hero Vardiwala. It is written and directed by Mahesh Pandey, also features Karan Pandey, Vikrant Singh Rajpoot, Sanjay Pandey, Vinod Mishra, Kanak Pandey, Manoj Singh Tiger and Priyanka Pandit aka Gargi in important roles. On a related note, before venturing into Bhojpuri cinema, Amrapali has worked in popular Hindi daily soaps.